Ray Parker has been involved in English Language Teaching since graduating in Hispanic Studies in the late 60s. He has taught, trained and examined teachers in more than 30 countries and co-authored a well-known teachers’ textbook on the phonology and pronunciation of English (The Phonology of English: an Introduction for Teachers of ESOL). His focus now lies with teacher training and ELT project management. Ray began his talk by demonstrating the difference between a syllable-timed and stress-timed language, and how it’s possible to say a 12 syllable sentence in the same amount of time as a 3 syllable phrase. The sentence and phrase were as follows, with the stressed syllables underlined. Because only three syllables are stressed in the first sentence, the others are mostly schwas, which for learners is a little like listening to a mess of noise with a few stressed recognisable sounds thrown in. The quality of delivery in stress timed languages is, Ray claims, much harder for non-native speakers to understand. We looked at word types and which are normally stressed (content words) and unstressed (function words). Ray argues that rhythm is not inherent in spoken English but is an occasional, accidental component of speech, or a deliberate component that we add on for artistic means – it is sometimes there, but it isn’t normal. He stresses, however, that this doesn’t make rhythmic language redundant in the classroom. It is, by its nature, memorable and enjoyable and therefore has its place. Ray also shared with us some dictation activities to help build students’ awareness of stress-timing in English. This is where Ray made the all-important link between pronunciation and listening – using gap-fill songs and passages as listening activities in which the function words are removed as opposed to the content words. I loved this idea as so often material encourages students to listen for content words, therefore exacerbating their problems understanding (stress-timed) English when spoken at normal speed in natural contexts. I also think this approach useful in a ‘dictogloss’ way for encouraging students to think about grammatical structure. Sometimes at home I’ll talk to my partner using only a series of “mmmmn” noises (usually if I’m eating and have my mouth full) and no distinguishable sounds. More often than not he understands what I mean to say and of course intonation and context play a huge role in his doing so. I wonder, however, whether it might be possible to distinguish between two different sentences, each with the same number of syllables, knowing nothing about context or intonation, only the difference in stress. As a point of interest, I intend to present the following to my students to see how they respond. For native speakers I imagine it should be very easy but this may not be the same for low level learners. Each of the following 2 sentences has 12 syllables. a) Tomorrow’s my birthday and I want a pet horse. 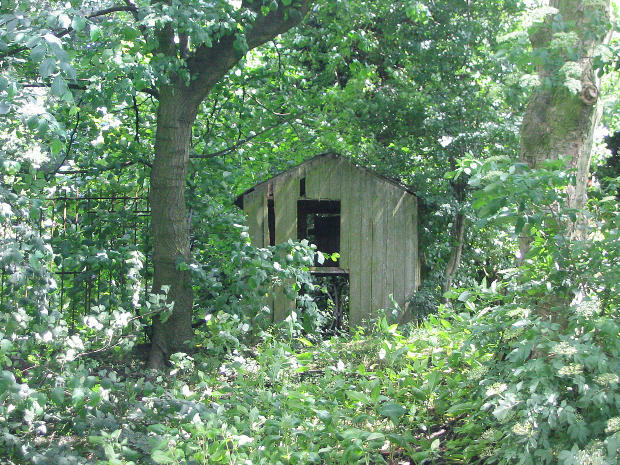 b) Its in the shed at the bottom of the garden. The ‘stress-pattern’ below represents one of the above sentences. Each square represents a syllable, with the larger squares representing stressed syllables. Which of the two sentences does the ‘stress-pattern’ represent? I also noted that when demonstrating the dictation activities, Ray was careful to speak at a natural speed rather than slowing down – as we often do in the classroom. With higher level learners I speak at my ‘normal’ speed, but with lower levels I often find it necessary to slow down. I do, however, make the effort to speak at a faster speed when I know students are familiar with the language I’m using, as I believe it vital for students to be exposed to authentic spoken English, rather than ‘classroom English’. Thanks Jade – how nice for a speaker to see that they actually got their message across!!! Hope to bump into you in Brighton. I am doing a CELTA course and Ray is one of my tutors..He is amazing and I am glad that he’s my tutor.